Why not use Lipo HV batteries? Li-Ion are reliable, but this is at the expense of energy density. I just checked out Hyperion G7 which is suppose to be newest HV lipo and it has almost twice less energy density than the li-ion packs I am using. On the other hand it can deliver almost 10x the discharge current of my pack so just depends on the application. For long slow flight li-ion may be better option. I recently achieved spot on 1 hour hover with a heavier, more conventional 2.1kg fpv tri versus the glued together, pure endurance machines I've seen. That was using 2 off the shelf 25C tattu packs in parallel for 4S 12000mah. All the typical hardware was there minus HD recording, which I intend to eventually add in the form of a Run Cam or equivalent after get more confident. It would be interesting to hear how the GEB8043125 batteries work out for you. They are the lipo cells I was talking about earlier and had good specs. 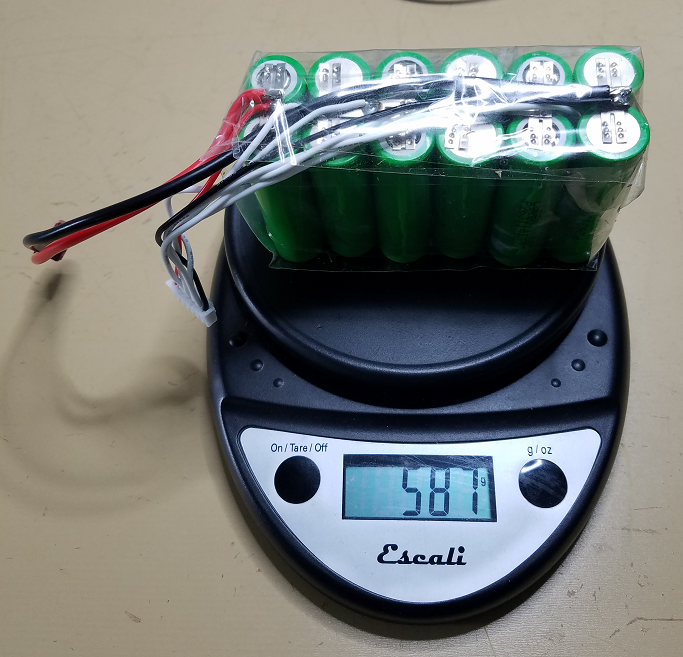 At 85g per cell they were the best lipo option I had run across and GEB was ready to build the packs but I just couldn't pin them down on the max discharge current. It took me awhile to get setup to weld the 18650 cells but now those 6s4p 14000ma packs weigh just under 1.2kg and will burst 80A. I pull about a 10.5A hover from the 14A pack so I am not straining them. edit: I realize I stated wrong cell in first post. The LG cell is LG18650MJ1 3.6v 3500ma 10A not LG1. What do you fly with that lead acid? ;-) That's a nice spot welder setup. Are the plans easily available for it? Just finished welding up a battery pack but noticed I had burnt another ground trace to mosfet. This makes 8 of 8 mosfet ground traces burned so obviously the trace needs to be a lot heavier copper. I simply repaired by replacing traces with multi stranded wire directly from the source pins to the ground bus mounting screws. I understand that a v2 mosfet board is available also that has heavier ground traces. Other than this issue it has been excellent spot welder and I weld heavy strip so really put the welder to the test. Here is the latest "chocolate" HG2 battery pack assembled. 4s2p 14.4v 6000ma 7C cont 382g. Still waiting on a prop to do full load tests but the fact it is running cold in current quad configuration shows it to be quite capable for intended purpose. I like your use of a minimalist printed carrier to coerce the pack into a more conventional cuboid shape...slick. Here is the discharge curve of the 4s2p "chocolate" HG2 pack. Discharge to 3v per cell yielded 29 minute flight time of 1300g quad but it started non linear voltage dive after 3.2v per cell which seems a little early to me considering the 2.5v cutoff. Ending pack temp of 58 C.
roteron with what you are getting time wise can you measure you are pulling about 206W between the 3 drives in hover? About 4.7A per motor? Its pulling less power than that on hover...around 170W to lift 2150g AUW, across the 3 drives. As the battery discharges to 3V/cell, per motor current increases from around 3.7A at the start, to 4.7A at the end. These are all actual measured values, and concur with the graph above. I've done these tests with individual motor/prop combos on my thrust stand as well as the entire assembly which produced the graph above. I've also actually flown with this hardware on a previous frame and the measured values are all realistic against those of the thrust stand. Free flight is slightly more costly due to real time stabilisation control, but if you can better control...or manage vibration...which is the intent of this new frame iteration, the difference isn't that great. If you don't then you can waste a lot of power unnecessarily and approach the 200W figure. Please bear in mind this isn't exactly micro sized, its got a 786mm pitch circle diameter to the motor shafts, and spinning DJI Matrice 600, 21" blades on custom hubs. You're absolutely right, and the next graph highlights exactly this. 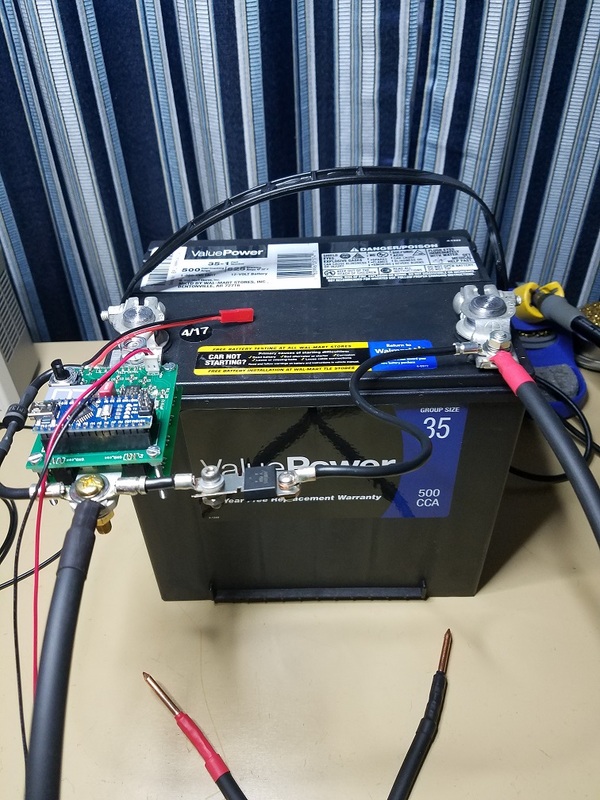 I received my HV lipo charger so conducted three new tests at 3 different loads, 133W, 175W and 268W, which closely coincide with 0.5C, 0.66C, and 1C. The centre one is applicable to my application as it represents the hover power for my fully loaded tricopter, i.e. long range fpv + UHF system etc. Each time the pack was fresh off the charger at 17.4V. Note that the extra voltage does indeed make a difference at these time scales compared to the first graph I showed above...around 5 more useful hover minutes...over 80 minutes. After finalising the Seppuku and doing a maiden and autotune I managed to do an ACTUAL hover test in the back yard. I used altitude hold mode which I found satisfactory on default settings, although I will make it slightly more responsive in time. I also think AH throttle control is far smoother than I can do manually which probably contributes to the result. very nice After the 4s2p 18650HG2 pack didn't do quite as well as I had hoped (3.2v knee) think I will stick with higher voltage and the GA/MJ1 cells. A light weight flyer with the 6s4p pack should do well in flight time. I need to beat current flight time of my 750mm quad lol. I'm very interested in this. I had ordered the V2 spot welder from Malectrics for rebuilding a laptop battery or two as well as making NiMH packs for my gliders. Getting 18650 cells shipped to Canada is harder than I'd imagined though, so things have stalled. Do you have a build log or other info on your setup?